100% Natural & Biodegradable, Handmade Konjac Fibre. The Konjac Sponge has a unique propriety layer that can hold water very well. 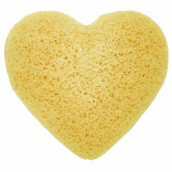 When the sponge is saturated with water, its surface is covered by a water layer. This water layer on the sponge's surface constantly acts as a buffer to the skin and the layer forms a barrier between the sponge and the skin. As a result, the skin is never in direct contact with the fibre and it will not scratch and damage the skin even with hard scrubbing.